Welcome to the 2015 K-State Geography Alumni Newsletter, an opportunity for us to share news and happenings from the past year with alumni and friends of the Geography Department! For the first time, the department will be switching this year to an E-newsletter in order to reach more of our alumni and friends. Kathy Zimmerman has worked diligently with the Division of Communication and Marketing on campus to make this shift. We look forward to hearing your comments and suggestions about the new format. 2014 was another great year for the faculty, students, and staff of the department. We welcomed Dr. Jida Wang to the department in August as an assistant professor. 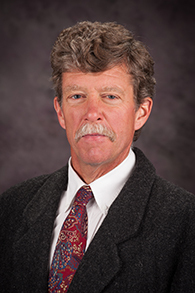 His research and teaching in earth system science and remote sensing add to existing departmental strengths in those areas, and we are very pleased to have him as a member of the geography community. We undertook one tenure-track assistant professor search at the end of 2014, successfully hiring Dr. Francesco Orsi (PhD 2010, University of Trento, Italy). Dr. Orsi, whose teaching and research interests are in the areas of land use planning and geospatial modeling, will join us this summer, the 14th tenured or tenure-track faculty member in the department. In October, the department honored Dr. John Guinotte (BS 1996, MA 1999) as the 2014 Distinguished Alumnus with a visit to campus and a chance to meet and interact with students and faculty. We co-hosted the joint annual meeting of the Southwest Division and Great Plains-Rocky Mountain Division of the Association of American Geographers in Albuquerque, New Mexico, in October. Dr. Shawn Hutchinson served as conference co-organizer. The members of the faculty and students in the department enjoyed remarkable success in the just-completed year, as you will see below and in the highlights on subsequent pages. The Steven Kale Scholarship Fund, endowed through the estate of the late Steve Kale, was created in June and will begin providing scholarship funds for geography students in Fall 2015. The department’s other Foundation funds continue to prosper thanks to the wonderful generosity of our alumni. In 2014 funds from geography Foundation accounts and other sources provided several thousand dollars of travel support for undergraduate and graduate students to attend professional meetings and workshops. In addition to financial support, our alumni generously contribute their time and expertise, whether serving on the Geography Alumni Advisory Board, visiting in the classroom with students, or contacting the department about job and internship opportunities. One of the more visible alumni events again this year was the 2014 Geography Career Day in February. The event continues to assist our undergraduate majors and graduate students in securing jobs and internships and provides them with valuable experience in preparing resumes and conducting interviews. Faculty Highlights: Members of the Geography faculty completed a very successful year in research, teaching, and professional service during 2014. Since 1 July 2013, faculty members of the department have secured more than $1 million in new extramural research funding. Geography faculty served as lead or co-editors of national and international professional journals, were appointed to editorial and scientific boards of national and international journals, elected national officers of professional organizations, and served as chairs and members of scientific committees for professional meetings and conferences. In 2014, faculty of the Geography Department authored 1 book and 25 refereed journal articles, completed book chapters and reviews, and gave 53 professional and invited research presentations, a remarkable accomplishment considering that all members of the faculty taught undergraduate and graduate courses and participated in a variety of departmental, university, and national service. As the personal summaries and highlights on the following pages attest, K-State geography faculty members are a diverse, dedicated, and highly productive group of scholars and teachers. Student Highlights: The Geography Department had a strong group of graduate students and undergraduate majors in 2014. At the end of the 2014 Fall Semester, the department counted 1 Post-Doc, 22 PhD students, 15 MA students, 66 geography majors, and 32 geography minors. Over 3200 students enrolled in Geography classes in 2013. Three of our students (Claire Ruffing, Bart Grudzinski, and Ben Munro) were awarded their PhD in 2014. Since the first doctoral students graduated in 2000, 35 students have completed the PhD degree in the department. Our MA program graduated 8 students in 2014 and 23 majors received the BA or BS degree this year. We also saw 1 student complete the Graduate Certificate in GIScience and 4 students finish the undergraduate certificate in GIS. In the annual advising survey of our majors, the department once again ranked among the top 10 departments at the university (out of 67 departments) in the overall quality of our student advising, and among the top 5 departments on campus in individual categories such as knowledge of the faculty about university and college policies and willingness of the faculty to answer student advising questions. Our students and alumni are making a positive impact in business, industry, government, and academia. The annual survey by Career and Employment Services at K-State of our graduates during the 2013/2014 academic year indicates that 72% are employed and another 22% are enrolled in a graduate or professional school. Current students have been selected for a remarkable array of awards outside the department as well as the annual departmental awards that are presented during our annual Spring Geography Banquet. You will read about some of the highlights in the pages that follow. Finally, the Beta Psi Chapter of Gamma Theta Upsilon (GTU) received the national Honors Chapter Award in 2014. Staying Connected with You: In addition to our webpage (http://www.k-state.edu/geography/), the K-State Department of Geography has a Facebook page and a KSU Geography Alumni page. I hope you will check them on a regular basis to keep up with events in the department and among our alumni. There are many reasons to be optimistic about the future of the Geography Department and the role it will play in the university. On behalf of my colleagues, I want to thank our alumni, parents, students, and friends for the gifts that support our students and help meet the needs of the department. Your generosity contributes substantially to the education of our students. As always, we welcome your comments about the department and K-State. When you are visiting campus, please stop by Seaton Hall and say “hello”. Thanks to all of you for your ongoing and generous support of K-State Geography!